WHO KNEW THIS PLACE EXISTED? 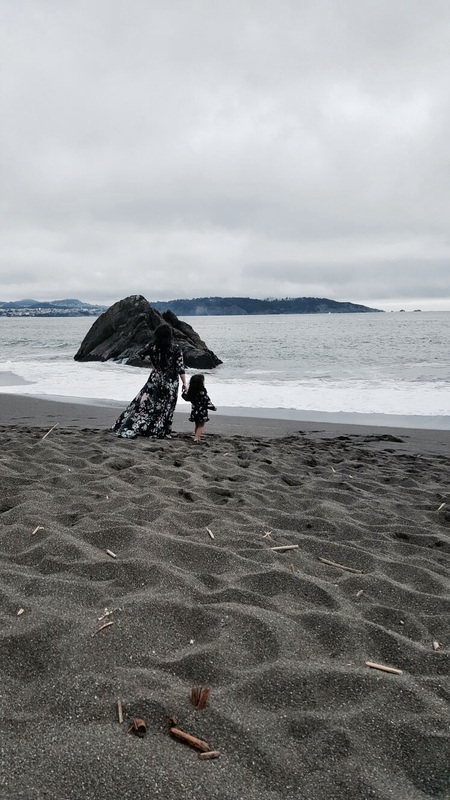 wE HAVE GONE UP TO MARIN HEADLANDS A ZILLION TIMES, MY HUSBAND HAS LIVED IN MARIN 30 YEARS, YET HE DIDN'T KNOW OF THIS SECLUDED BLACK SAND BEACH. i FOUND IT ON INSTAGRAM ONCE AND I COULDN'T WAIT TO GO THERE. wE DEciDED THE NIGHT BEFORE WE WILL DO OUR WEEKEND PICNIC AT THE BEACH AT THIS AWESomE PLACE AND THE CLOUDY GLOOMY WEATHER DIDN'T STOP US. it was A BEAUTIFUL coastal DRIVE UP TO THIS PLACE, WHILE THE HIKE DOWN WAS SUPER EASY, THE HIKE UP NOT SO MUCH! BUT STILL WORTH IT. me and my husband enjoyed our boudin sandwiches and lemonade mocktails on the beach while our little one couldn't be more excited to be playing with the black sand. there was only a few other people at the beach, just the way we like it!